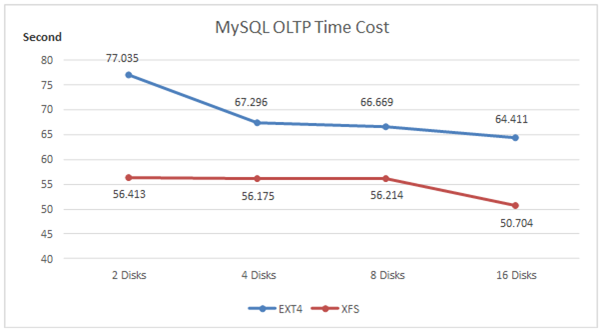 There are many factors that affect MySQL performance on Azure, both in virtual hardware selection and software configuration. This article focuses on optimizing performance through storage, system, and database configurations. Azure has two different deployment models for creating and working with resources: Azure Resource Manager and classic. This article covers using the classic deployment model. Microsoft recommends that most new deployments use the Resource Manager model. For information about Linux VM optimizations with the Resource Manager model, see Optimize your Linux VM on Azure. Starting November 15, 2017, virtual machines will be available only in the Azure portal. Storage is the key factor that affects database performance in cloud environments. Compared to a single disk, RAID can provide faster access via concurrency. For more information, see Standard RAID levels. 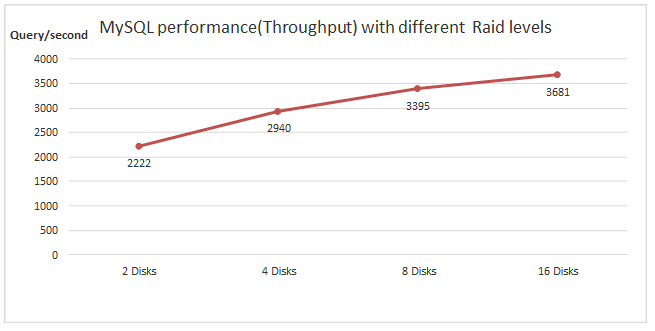 Disk I/O throughput and I/O response time in Azure can be improved through RAID. Our lab tests show that disk I/O throughput can be doubled and I/O response time can be reduced by half on average when the number of RAID disks is doubled (from two to four, four to eight, etc.). See Appendix A for details. 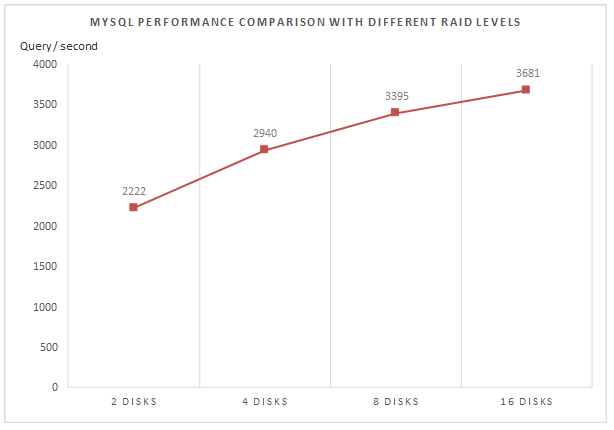 In addition to disk I/O, MySQL performance improves when you increase the RAID level. See Appendix B for details. You might also want to consider the chunk size. In general, when you have a larger chunk size, you get lower overhead, especially for large writes. However, when the chunk size is too large, it might add additional overhead that prevents you from taking advantage of RAID. The current default size is 512 KB, which is proven to be optimal for most general production environments. See Appendix C for details. There are limits on how many disks you can add for different virtual machine types. These limits are detailed in Virtual machine and cloud service sizes for Azure. You will need four attached data disks to follow the RAID example in this article, although you can choose to set up RAID with fewer disks. This article assumes you have already created a Linux virtual machine and have MYSQL installed and configured. For more information on getting started, see How to install MySQL on Azure. The following steps show how to create RAID on Azure by using the Azure portal. You can also set up RAID by using Windows PowerShell scripts. In this example, we will configure RAID 0 with four disks. 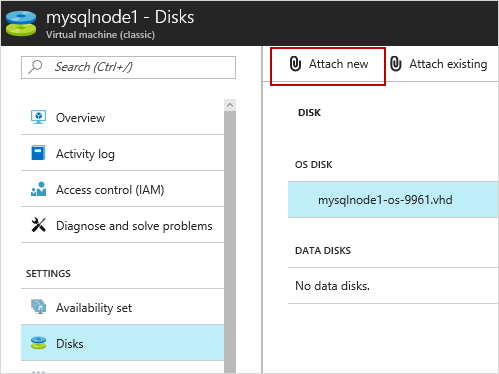 In the Azure portal, go to the dashboard and select the virtual machine to which you want to add a data disk. In this example, the virtual machine is mysqlnode1. Click Disks and then click Attach New. Create a new 500 GB disk. Make sure that Host Cache Preference is set to None. When you're finished, click OK. This adds one empty disk into your virtual machine. Repeat this step three more times so that you have four data disks for RAID. The following steps describe how to configure software RAID on Linux. If you are using the XFS file system, execute the following steps after you have created RAID. You can select different I/O schedulers under different scenarios to optimize performance. In a completely random access environment, there is not a significant difference between the CFQ and Deadline algorithms for performance. We recommend that you set the MySQL database environment to Deadline for stability. If there is a lot of sequential I/O, CFQ might reduce disk I/O performance. For SSD and other equipment, NOOP or Deadline can achieve better performance than the default scheduler. Prior to the kernel 2.5, the default I/O scheduling algorithm is Deadline. Starting with the kernel 2.6.18, CFQ became the default I/O scheduling algorithm. You can specify this setting at kernel boot time or dynamically modify this setting when the system is running. The following example demonstrates how to check and set the default scheduler to the NOOP algorithm in the Debian distribution family. Setting this for /dev/sda alone is not useful. It must be set on all data disks where the database resides. One best practice is to disable the atime logging feature on the file system. Atime is the last file access time. Whenever a file is accessed, the file system records the timestamp in the log. However, this information is rarely used. You can disable it if you don't need it, which will reduce overall disk access time. To disable atime logging, you need to modify the file system configuration file /etc/ fstab and add the noatime option. Test the modified result. When you modify the test file, the access time is not updated. The following examples show what the code looks like before and after modification. MySQL is a high concurrency database. The default number of concurrent handles is 1024 for Linux, which is not always sufficient. Use the following steps to increase the maximum concurrent handles of the system to support high concurrency of MySQL. To increase the maximum allowed concurrent handles, add the following four lines in the /etc/security/limits.conf file. Note that 65536 is the maximum number that the system can support. Put the following startup commands in the /etc/rc.local file so it will take effect at boot time. 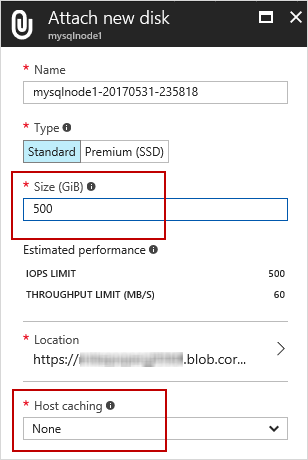 To configure MySQL on Azure, you can use the same performance-tuning strategy you use on an on-premises machine. To optimize MySQL server settings, you can update the my.cnf file, which is the default configuration file for both server and client computers. innodb_buffer_pool_size: The buffer pool contains buffered data and the index. This is usually set to 70 percent of physical memory. innodb_log_file_size: This is the redo log size. You use redo logs to ensure that write operations are fast, reliable, and recoverable after a crash. This is set to 512 MB, which will give you plenty of space for logging write operations. max_connections: Sometimes applications do not close connections properly. A larger value will give the server more time to recycle idled connections. The maximum number of connections is 10,000, but the recommended maximum is 5,000. Innodb_file_per_table: This setting enables or disables the ability of InnoDB to store tables in separate files. Turn on the option to ensure that several advanced administration operations can be applied efficiently. From a performance point of view, it can speed up the table space transmission and optimize the debris management performance. The recommended setting for this option is ON. From MySQL 5.6, the default setting is ON, so no action is required. For earlier versions, the default setting is OFF. The setting should be changed before data is loaded, because only newly created tables are affected. innodb_flush_log_at_trx_commit: The default value is 1, with the scope set to 0~2. The default value is the most suitable option for standalone MySQL DB. The setting of 2 enables the most data integrity and is suitable for Master in MySQL Cluster. The setting of 0 allows data loss, which can affect reliability (in some cases with better performance), and is suitable for Slave in MySQL Cluster. Innodb_log_buffer_size: The log buffer allows transactions to run without having to flush the log to disk before the transactions commit. However, if there is large binary object or text field, the cache will be consumed quickly and frequent disk I/O will be triggered. It is better increase the buffer size if Innodb_log_waits state variable is not 0.
query_cache_size: The best option is to disable it from the outset. Set query_cache_size to 0 (this is the default setting in MySQL 5.6) and use other methods to speed up queries. 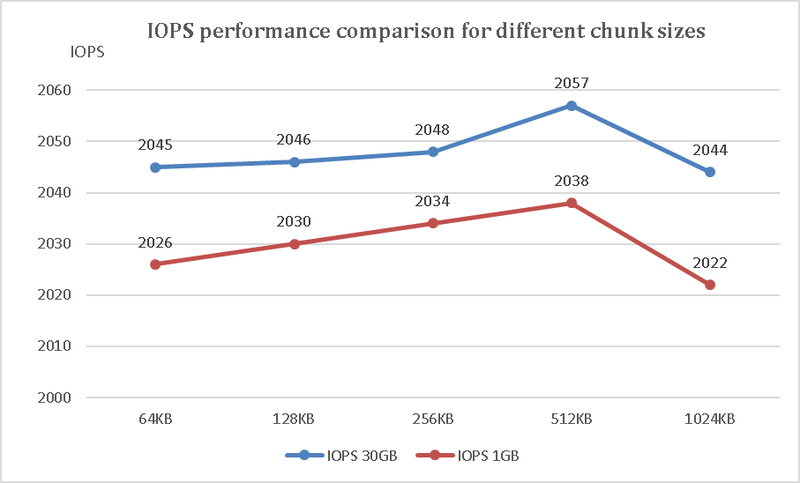 See Appendix D for a comparison of performance before and after the optimization. The MySQL slow query log can help you identify the slow queries for MySQL. 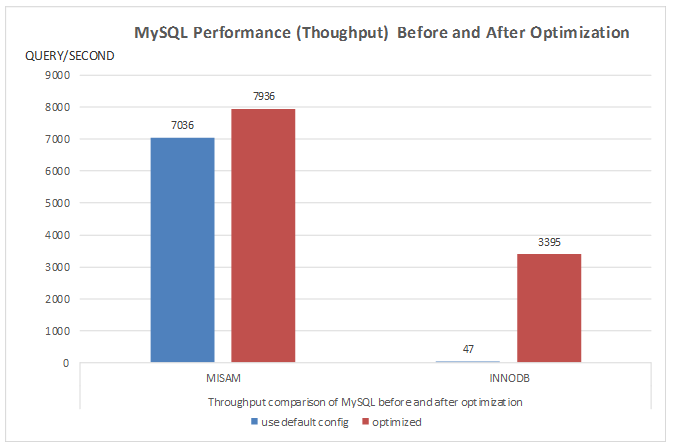 After enabling the MySQL slow query log, you can use MySQL tools like mysqldumpslow to identify the performance bottleneck. Check whether the setting is taking effect by using the show command. In this example, you can see that the slow query feature has been turned on. You can then use the mysqldumpslow tool to determine performance bottlenecks and optimize performance, such as adding indexes. The following are sample performance test data produced in a targeted lab environment. They provide general background on the performance data trend with different performance tuning approaches. The results might vary under different environment or product versions. The workload of this test uses 64 threads, trying to reach the upper limit of RAID. The file sizes used for this testing are 30 GB and 1 GB, respectively, with RAID 0 (4 disks) XFS file system. For more detailed optimization configuration parameters, refer to the MySQL official instructions.